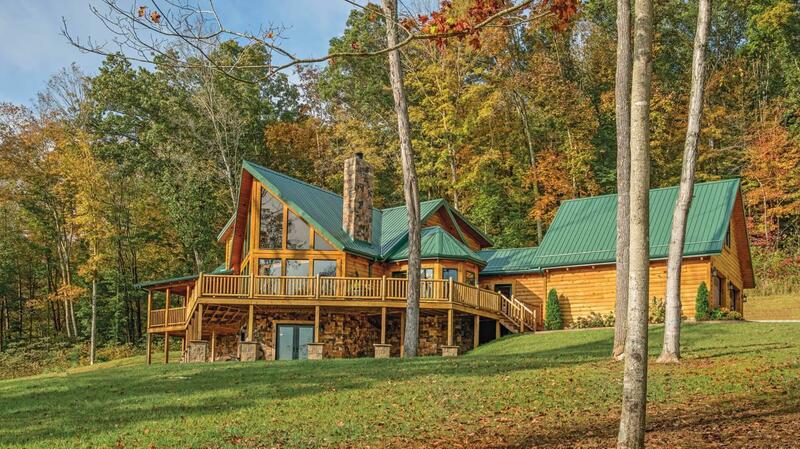 Fast-forward several years to June 2013: The lovebirds bought nine acres of property and began building a 4,400- square-foot cabin with Appalachian Log Structures of Ripley, West Virginia. While deer-hunting, Joe had already scoped out the land and determined how best to position the home in order to enjoy a spectacular view of the valley. “Our cabin sits high on a hill, so our view is as if we’re up in a tree stand,” says Joe, a flooring production install manager. 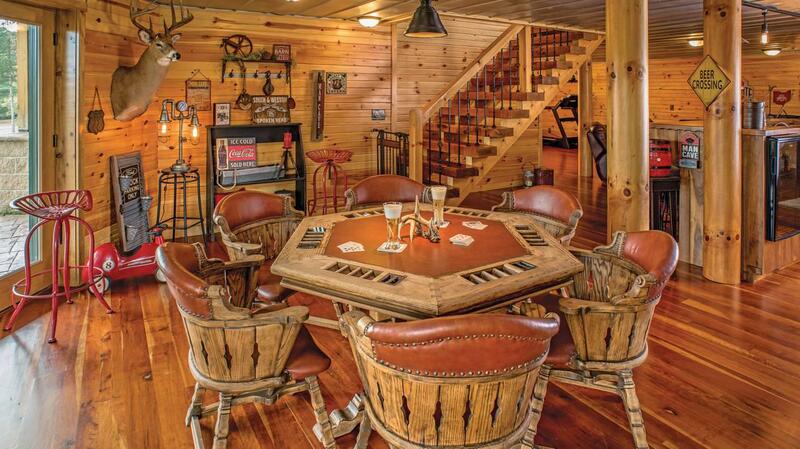 “Every day we watch deer and wild turkey cross the fields.” The four-bedroom, 3.5-bath home has a loft and a decked-out man cave, complete with a full bar, poker table, air hockey table and an exercise area. In addition, they built a giant wraparound deck ideal for entertaining. Though they always get compliments on the breathtaking view, the thing visitors rave about most are the kitchen’s leathered granite countertops. “When people see them in person, they go nuts,” says Hope, a pharmacist who fell in love with both the look and feel of the material. “I wanted my counters to have lots of character — swirls rather than specks, texture rather than shine, colorful rather than bland,” explains Hope, who ultimately chose tan to bring out the hickory cabinets with splashes of turquoise (her favorite color). The texture was just up her alley, too. “It’s smooth but with a groove in it,” she says. 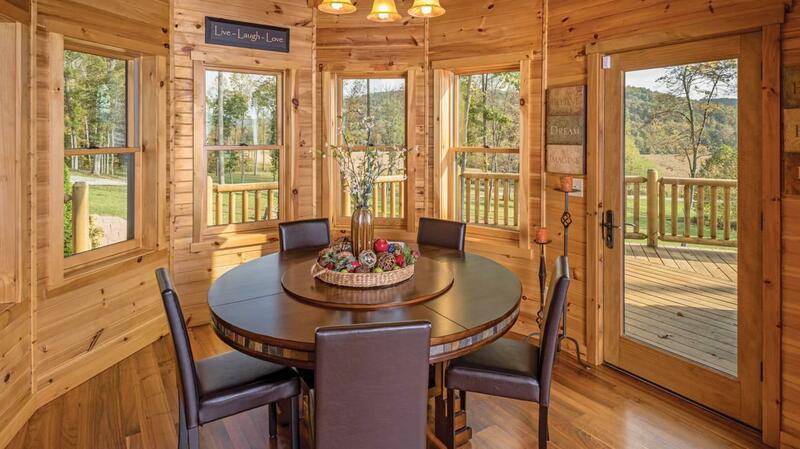 A group of Amish craftsmen were integral in creating the cabin’s cozy charm. 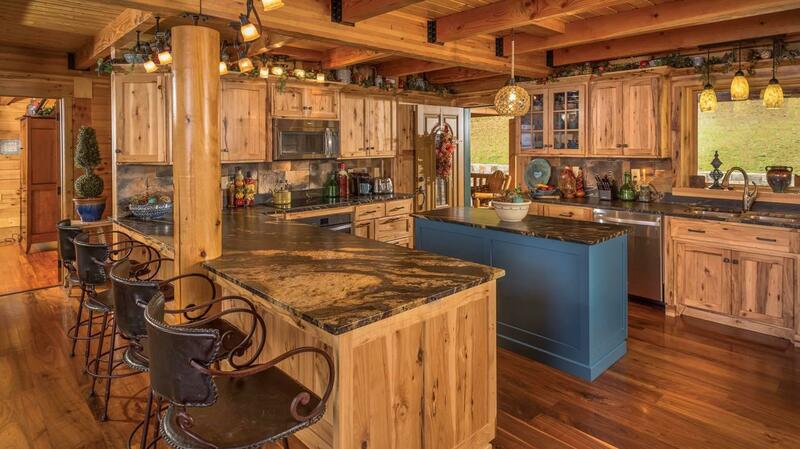 The kitchen’s hickory cabinetry was handcrafted by an Amish artisan named Allen Keim. A second Amish fellow, Alan Crabtree, fashioned the white oak cabinets in the basement, making notches in them to hang wine glasses and bottles. 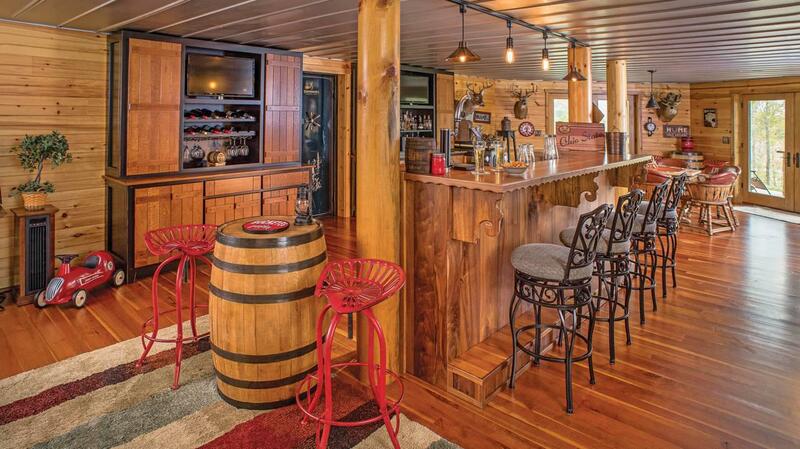 Another talented man from the couple’s Amish construction crew custom-made the basement bar from leftover walnut and cherry flooring. The home, constructed with D-shaped eastern white pine logs with an interlocking corner and finished with CTA Products Group’s Outlast Q8 natural oil stain, boasts genuine hardwood flooring throughout. Walnut was used upstairs and in the main living area. The breezeway, master bedroom and basement are cherry. “We purposefully chose different types of wood to create contrast,” explains Joe. Given that the master bathroom is rich with wood, to help break up the room a bit the couple installed earthy brown, red and orange dry-stack stone by Dutch Quality Stone on the wall behind the tub. “We rocked the wood around the doorway into the kitchen and the backsplash in the kitchen, so we figured why not do the same in the bathroom?” Hope explains. For the fireplace, again they turned to Dutch Quality Stone’s product, “Sienna Castle,” a look similar to limestone with beautiful muted earth tones. The couple’s two children — Grant, 4 and Cade, 2 — weren’t forgotten in the interior design process. Since Grant likes fishing, hunting and camping, Hope thought it would be fun to incorporate a tent into his bedroom’s design. Her mom, Carol, a creative spirit, ran with it and fashioned a canopy tent above the upper portion of the bed. “She made it ten times better than anything I could have envisioned,” says Hope. And that’s quite a testament, when you consider that this magical log home is the realization of years of planning, dreaming and visions of the future. 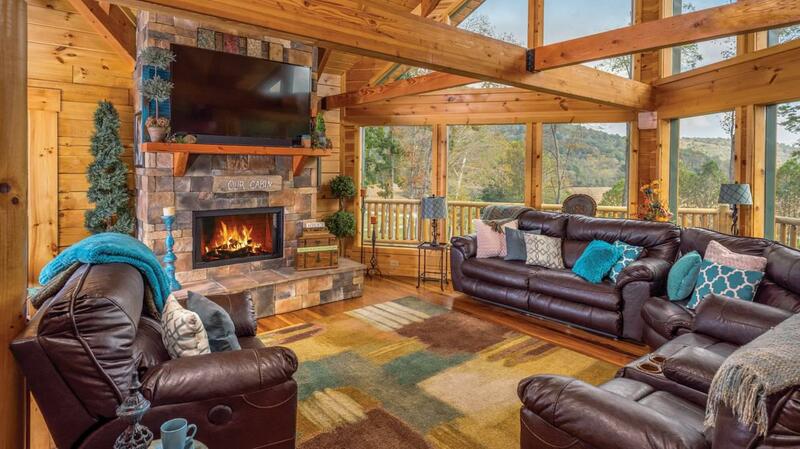 Log Provider/Builder: Appalachian Log Structures Inc.
Set on nine acres of wooded countryside, the Brewsters’ home is adjacent to 130 acres of surrounding land that Hope’s dad owns. The couple purchased 50 acres of connecting farmland so that they could raise cattle on the property. The Brewsters wanted to incorporate pops of color into the home — particularly turquoise, Hope’s favorite. They installed an island, painted slate blue, then chose Spectrus leathered granite countertops, which infuse both shades of tan and splashes of turquoise into the textured, swirled pattern. The dining room offers gorgeous views of the rolling landscape and abundant wildlife that regularly meander the property. The intricate ceiling above the dining area accentuates the beautiful outdoor views. 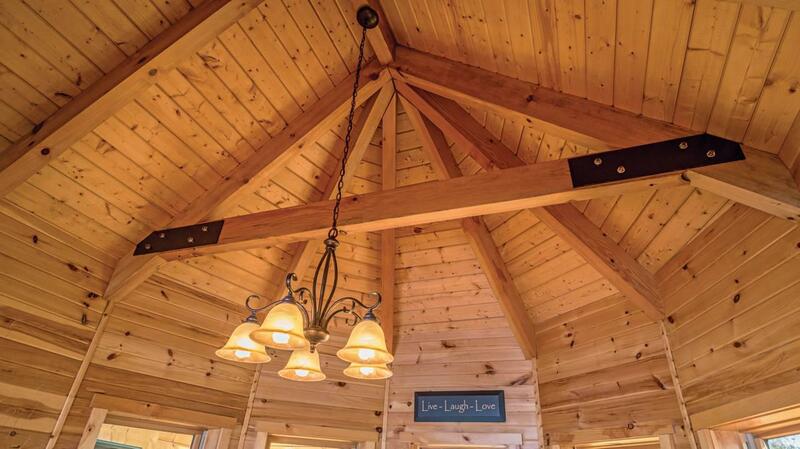 The key to the cabin’s beautiful interior design is the blending of rustic elegance with modern choices. Hardwoods, stone and granite are softened with supple leather, colorful throw pillows, textured blankets and vibrant area rugs. 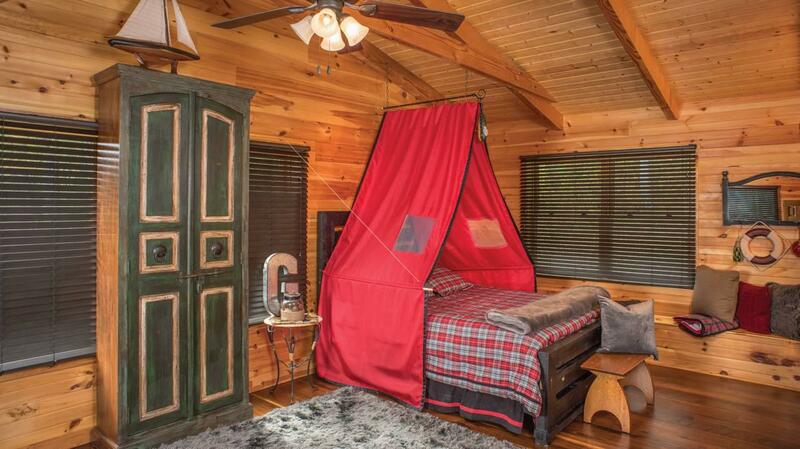 The red tent-themed bed was inspired by Hope and Joe’s eldest son’s love of the outdoors. Their 4-year-old avid fisherman/hunter/camper enjoys pretending to snooze beneath the stars. While selecting furnishings, the couple stumbled upon an old poker table at an auction, which they snatched up and refurbished — a perfect addition to the tongue-and-groove clad man cave. Though the Brewsters chose to steer clear of the popular “bear and moose” motif, they were not opposed to infusing some log-home standbys, including trophy mounts, oversized rustic barrels and weathered antique signs.